In December of the previous year, when I first had come to Luperón, I already had received a first impression of these folk's way of thinking: in one house out of two a treasure seems to be buried - throughout the entire village! Treasures are a constant topic there. As soon as the voice spread that R. had brought this mysterious detector, people regularly asked him to do them the favor of figuring out the exact location of "their" treasures. These treasures could roughly be divided into three different categories. One group consists of the Taino-Indian relicts, that is objects left behind by the pre-Columbian native inhabitants of the island. Then there are "historic treasures", that is those buried by pirates. The bay of Luperón counts among the safest natural harbors worldwide, and Columbus' first settlement on the island is very close by (his first landing was in "La Navidad" - today Haiti - however soon destroyed by the Indians. On his second landing, with many thousands of men, he founded the first settlement "La Isabela" (after the Spanish Queen) at a distance of at about 18 km from Luperón. Moving everything to the south coast and the foundation of Santo Domingo (the current capital) was mainly inspired by an insect plague, impossible to control (some say ants, some say mosquitoes) - everybody just jumped back on the ships and fled to the other side of the island. A third group of treasure are those hidden by rich private persons, who simply had no other place to store their wealth - there were no banks, or times were politically restless (dictatorship of Trujillo, etc.) These people would bury their "Onzas" simply somewhere in the garden, some of them forgot the exact location, others took their knowledge into their grave. Six weeks of treasure hunting have left us with all kinds of different experiences and impressions, and a lot of stories told by other treasure hunters (in Luperón there are actually people who became wealthy all of a sudden...). For example there was that story of a group of men digging a hole on a lonely beach, in the night, suspecting to find something... all of a sudden a boat approaches them, with antiquary uniformed men coming towards them... a man decorated with strange chains, approaches the digging in a way trying to scare the workers away, but as nobody moves, he evolves into an enraged bull (which - and this is funny - is wearing the same kind of golden chains as previously the men...) The worker who told us this story, said he would simply hide in the digging hole until the bull had gone away, and then continue the work... That night however they did not find anything. But some nights later other people went to the same place - today owner of the gasoline station and the local supermarket. We then consulted with the local priest about his opinion on the "dead persons protecting their treasures". But he turned out do be a sober, western-thinking man, whose opinion is that "dead is dead", and there was nothing to be feared (except maybe the "living ones"). And, concerning the holy water - actually this had been another reason to visit him: we had been advised to carry holy water to all our digging sites - we could have as much as we wanted from him. Again, R. went consulting with one of the "Curanderos". This lady sent him buy some mysterious substance a "Botanica" (a kind of "herb store" - where all those little bottles with colorful water are being sold). I was curious, so I came along, and when the salesman arrived with the desired, he was proud to show us, opening the capsule it came rolling out... mercury! "Oh, said I, that's however poisonous!" - What actually was poisonous was the way the guy looked at me, and then he explained that this substance could not be poisonous at all, because already there have been people eating such capsules (yes, they actually look like any medicine), and that "which was happened to those people was: nothing"... At our next excavation this wonderful "Mercurium" was poured then into the digging hole (environmental protection - no, thank you!) - it was supposed of magically "lift" the treasure towards the top - however then: nothing happened. Material: unknown material. In relation to its size the figure is very heavy. 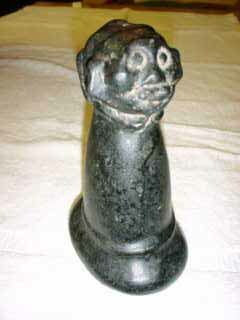 The material is furthermore unlike the stones, that are used usually for Taino sculptures. 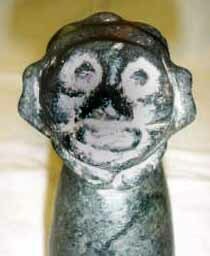 Our metal detector reacted strongly on the figure (it smells gold or?? Money?) The material is shimmers silvery and is very hard. 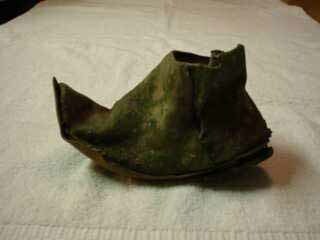 A mysterious shoe we found at a remote beach.